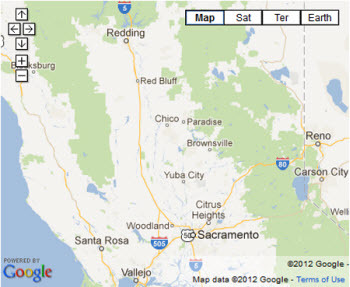 CSU, Chico is 90 miles (145 kilometers) north of Sacramento in the heart of the Sacramento Valley. Enjoy an easy and scenic drive, or travel by plane. Sacramento International Airport (SMF) is 90 miles south of Chico. The North Valley Shuttle http://www.northvalleyshuttle.com (530) 891-1219 is available for ground transport from the Sacramento airport to Chico (90 miles). The North Valley Shuttle has limited service (twice daily round trips) and reservations are recommended. Continue west to the Esplanade and turn left onto the Esplanade into downtown Chico. Esplanade becomes Broadway. To get driving directions to our campus via Google, enter your address or zip code in the form below. All major rental car companies are available from Sacramento. Please call your company of choice. Must make reservation ahead of time. AMTRAK and Greyhound Bus also have regular service into downtown Chico, although hours are limited. The AMTRAK train depot is located at W. Fifth and Orange Streets, telephone: 895-8000 or 800-872-7246. The train leaves twice daily at 3:06 a.m. southbound and 1:42 a.m. northbound. The San Joaquin is a combination train and bus ride that leaves Chico three times daily, all southbound at 9:25 a.m., 11:55 a.m. and 3:30 p.m. This service terminates in downtown Los Angeles. Contact your local travel agencies for details.